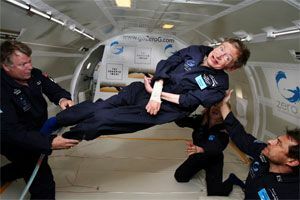 I have read several books by and about the brilliant British scientist Stephen Hawking who suffers from motor neuron disease and once I even heard him lecture at London’s Royal Albert Hall. So I was delighted when this week he fulfilled his ambition to go weightless. He did it by taking a flight in a specially-adapted Boeing 727-200. If you fancy the experience yourself, then – at a price – it’s available for almost anyone from this company. The ZERO-G Experience, which includes a flight of 15 parabolas, flight suit, complimentary merchandise, awards, a post-event party, photos, and a DVD of the flight, is offered at a price of $3,500 per seat. This entry was posted on Saturday, April 28th, 2007 at 10:23 am and is filed under Science & technology. You can follow any responses to this entry through the RSS 2.0 feed. Responses are currently closed, but you can trackback from your own site. I particularly like this picture from the Washington Post (via boingboing), with an apple, a nod towards Isaac Newton (even though the apple story is probably just a story).